The ARCA Racing Series presented by Menards entry list for the Music City 200 at Fairgrounds Speedway is on the move, in large part because of a big push from Lira Motorsports, which is fielding five Ford Fusions for the April 9 race. Missouri brothers Clayton and Kyle Weatherman will be teammates at Nashville under the Lira banner — Clayton in the No. 93 and Kyle in the No. 58. Kyle, the 2015 SCOTT Rookie of the Year and Short Track Challenge champion, opened the season with a third-place finish at Daytona. California’s Sheldon Creed (below) will be making his ARCA debut at Nashville for Lira Motorsports in the No. 38. Creed, a Speed Energy Formula Off-Road series champion driver in the Stadium Super Trucks, also has 25 career wins in the Lucas Oil Off Road Racing Series. Making his return to the ARCA Racing Series is High Point, North Carolina’s Travis Swaim in the No. 59 Lira Motorsports car. Swaim, in his one and only ARCA start in 2013, finished fifth at Salem Speedway. 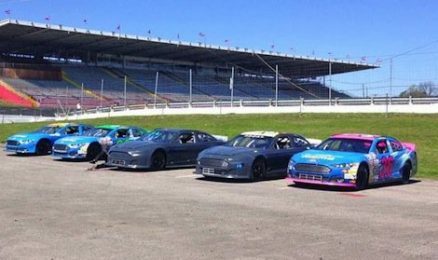 A veteran late model racer, Swaim is also a former Myrtle Beach 400 winner, UARA Late Model champion, North Carolina NASCAR Whelen All American Series state champion, and a three-time Caraway Speedway Late Model Stock Car track champion. Brandon Lynn, another full-time driver in the Lira camp, will be making his first Nashville start in the No. 36. Lynn finished on the lead lap in the Daytona ARCA season opener, coming home 16th. Venturini Motorsports is also loaded up with three entries, including veteran and five-time ARCA winner Tom Hessert in the No. 25 team flagship machine. VMS is also introducing two ARCA newcomers at Nashville — Cole Williams in the No. 55 and 15-year-old Christian Eckes in the No. 66. Both Williams and Eckes are making ARCA debuts at Nashville. Despite his ARCA debut, Williams is already the 2014 Pro Late Model track champion at Nashville. Cunningham Motorsports is coming with two entries, both with rookie drivers. Indiana’s Chase Briscoe (finished fourth at Daytona) is entered in the No. 77 Ford with his teammate Kevin Thomas Jr. entered in the No. 22 Ford. Pennsylvania’s Matt Kurzejewski is also entered in the No. 52 for Ken Schrader Racing. Two-time Daytona winner and NASCAR veteran driver John Wes Townley is entered in the No. 05 Chevrolet for Athenian Motorsports. Other notable entrants include Josh Williams, Thomas Praytor, A.J. Fike, Shane Lee, Dylan Martin, Brad Smith, Brian Finney and Alx Danielsson. ARCA championship team Mason Mitchell Motorsports and Bobby Gerhart Racing have also filed entries.